Hi there. i just got this thought that i could teach you guys some japanese cause im going to japanese classes! so i'll update this topic one time/week! And i hope you'll learn something from it! I'll add the Katakana letters soon when we have got to that part. Well this was what i learned today (1,5 hours) it's not much but learn this and then we will learn more! next time i'll teach you how to make sentences! HOPE YOU ENJOY! take your pencil and some paper and teach teach! please excuse my english, im not so well at english. BTW: there is a subtle difference in the pronunciation of "ou" and "oo", so you may want to do a direct transliteration. This is a cool thread~ You're nice to share what you learn. Im just glad to help you guys! what do you mean with "i don't understand by ur writing as in it look weird gomen"?? 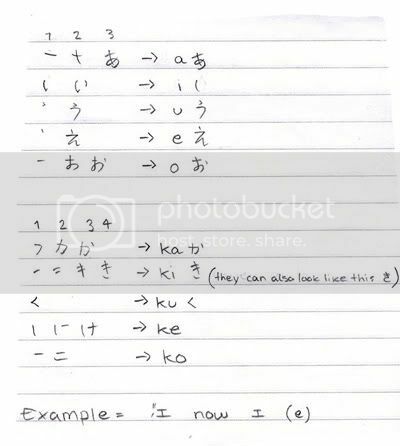 hm.. oops i did not make myself clear enough i meant by i can't see ur words clearly those u written on the paper..
i have some hiragana and katagana flashcards. would anyone like me to post them here? not at all! post themif you want to!! hihih, thank you haha you're funny !! This is basically just "please". If you're ordering tea at a restaurant, you could say "ocha onegaishimasu". On the other hand, if you actually need help (in a more urgent kind of way...like "help! "), you say "tasukete!". "Arimasu" actually just means "exists", and it can mean a number of different things in different situations (e.g. if I'm looking for something, and then I see it, I could also say "arimasu! "; in that case it translates to "there it is!"). "Arimasu" is the polite (Teineigo) form of the verb "aru" (to exist). By the way, in Japanese there is a distinction made between animate (living) and inanimate objects. There's a different word for "to exist" for living things -- "iru". If I ask if you have any siblings, you could say "imasu" ("yes, I have" -- or literally, "[they] exist"). But don't say "arimasu" in that case. Those should be "ohayou", "sayounara", "arigatou", and "gochisousama". As broken::dreams pointed out, there is a difference between "oo" and "ou". Usually, an extended "o" sound is "ou", but sometimes it's not (e.g. Osaka [Oosaka], and Otsuka [Ootsuka]).